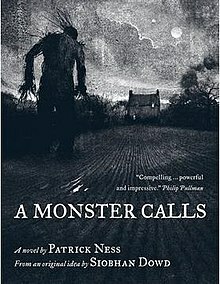 Patrick Ness is an author I stumbled upon after reading his breathtaking A Monster Calls, which is middle grade fiction. Then I ventured to the fascinating More Than This, which is high level young adult. Of course then I wanted to venture into his adult writing, and I began with The Crane Wife. I often tell my students when they are about to embark on an “author study” to see if they can notice rhythms in the prose or a pattern to the kinds of things that are explored in the writing. For Ness, from what I can tell, he seems to come back to the metaphor of story and truth–a concept that many would find to be contradictory. The Crane Wife is based on a Japanese folk tale and, in Ness style, cannot be defined by one clear genre: there are moments that feel like magical realism, or might be defined as other-worldly, or spiritual. The beauty in his writing is that these forces all come together in a way that suggests that of course this is true. This sense of magic or deep tragedy that steps outside our usual human experience matches up with our day to day more closely than actual realism. As Ness overlaps his adaptation of the folktale, which is narrated intermittently throughout the story, with the main characters and conflict of the novel, with other text inspirations for the story like the Decemberists’ album The Crane Wife, the reader can see how Ness sees the world as a place of overlapping themes that gently nudge against each other in a variety of genres. The novels follows a lonely, divorced man, George, his assistant in the small printshop he owns, and the man’s daughter and grandson. George wakes one night to a strange noise and finds an injured crane in his backyard, which he brings back to health. The next day, a woman walks into his printshop, wanting help with her pieces of art and George falls in love. The mysterious woman begins to add George’s small pieces of art with her own, and they soon find themselves creating highly sought-after pieces in the art world. There were as many truths–overlapping, stewed together–as there were tellers. The truth mattered less than the story’s life. A story forgotten died. A story remembered not only lived, but grew (42). The world has always been hungry, though it often does not know what it hungers for (139). A story must be told. How else can we live in this world that makes no sense? …Stories do not explain. They seem to, but all they provide is a starting point. A story never ends at the end. There is always after (141-142). Stories shift depending on who is doing the telling (269). Everyone needs forgiveness. It is the most loving thing one person can do for another…It is what makes life possible. It is what makes life livable (269-270). This entry was posted in story as metaphor, Uncategorized on April 6, 2015 by krobb08. I love my job for a lot of reasons. I was reminded of the best one while at class a few weeks ago: that reading and writing are tools for meaning-making. My professor handed us a copy of some of the new Common Core Standards for reading and writing, documents I’ve been looking at professionally for a number of years now. She wanted to experiment to see if we could train our eyes to look at the standards in a new way: to find the “echoing chord” of the work it is asking us to do. For instance, she looked at Reading Standard 1, which is about referring to details and creating inferences and said that for her, the small details of life have always mattered: small objects, a look, the things of small beauty that make her feel grounded again. She said to create meaning from the standards, we have to leave reading and writing aside, go into our lives, and then return to reading and writing. In that space we will find the moments and the lessons that will make our teaching come alive. I proceeded to look through the standards in a way I’ve never done as a teacher. All of a sudden, describing a setting in depth became deeply worthwhile. I thought about what my home means to me: the chalk mural of Ohio and New York my husband made, our wall of old family photos, the urban basil we are attempting to nurture in the window. These details began to tell a story of the place–and I realized that to teach setting, we can think about the settings that have been significant to us. We can grow that into understanding characters and themes and moods. It’s beautiful life work. I went on to do this thinking with sequence of events, point of view, literary patterns…and I’ve never felt more passionate about the work I get to do each day. And of course, I was finishing the book Beautiful Ruins by Jess Walters on the train that day and everything came together beautifully. The book’s cover is a picture of Manarola, part of the Cinque Terre in Italy, where I visited on my honeymoon last summer. This plus an endorsement from a friend was enough to get me interested. It is set in Italy in the 60s, California in the present day, and a handful of other places as we follow the various archs of the characters. It mostly tells the story of a young actress who finds she is pregnant with a famous actor’s child, and then finds companionship in the young owner of a hotel in Italy where she is sent by a producer to hide the pregnancy. The reader follows these characters into the future, where their lives intersect 50 years later. This was an entertaining read for the first half and then became a deeply poignant read for me. Walters is writing, essentially, about story and meaning-making: how people are changed, shaped, and propelled forward. By the end I was utterly floored by the ways he interwove these characters and their regrets, justifications, creative pursuits, and their journeys to make meaning in their lives. There are a lot of gorgeous, thought provoking lines I could quote and write about, but without context, they lose part of their depth. So, I will leave it at this: there is a moment toward the end of the story where the entire mismatched cast of characters are watching local theater in Idaho and find themselves stunned and moved by what they see and they all draw inward. And this, I think, is what they were looking for all along: something that would propel them to stop, think, and make meaning. The title provides some insight into the discoveries–beauty has emerged from the struggles. Walters is insightful enough that not every character has revelations that bring rich insight and inner peace. Through those characters readers can see the shells of existence that remain when life merely becomes a place to craft and project an image. So, this book helped propel my current planning for my summer reading and adventuring…more to come soon, but it is all operating under the theme of looking at art and the details, draw inward, and live. This entry was posted in books, education, healthy rhythms, identity, small moments, story as metaphor, teaching, Uncategorized on May 18, 2014 by krobb08. My cousin recommended a middle grades book, A Monster Calls by Patrick Ness, which is stunningly illustrated by Jim Kay. I hadn’t yet heard of it, but apparently it is causing quite a stir, having already won the Carnegie Medal for literature and the Kate Greenaway Medal for illustration. It is beautifully written, smart, and the pictures are breathtaking–but it is not for the faint of heart; I cried for over an hour when I finished it, which I do not admit lightly. There is such beautiful, difficult truth in this book, though, that I find it impossible not to recommend. The main character Conor has been having a terrible nightmare, which he cannot talk about and does not reveal until the end of the story, that began when his mother started getting treatments for cancer. In the mean time, a monster begins showing up at 12:07 every night, claiming that he only comes walking in matters of life and death. Conor has no fear of this monster because in comparison to his true nightmare, he isn’t scary at all. The monster tells him he is going to tell him three stories, which are “the wildest things of all…Stories chase and bite and hunt,” (37) and then, he says, Conor will tell the monster a story–his story, his truth, what happens at the end of his nightmare, that he cannot tell anyone. What is brilliant about the book is the way the monster interacts with Conor and the way that the stories he tells symbolize the complexity of what it means to be human–Ness has crafted a story that gets at the heart of pain and healing in a way that is significant and weighty and truthful for both 12 year olds and adults. Through the narrative voice of the monster and his stories, he approaches life’s biggest fear–loss–in a heart wrenching, beautiful, and most important, truthful, way. After the first story, they have this exchange: “So the good prince was a murderer and the evil queen wasn’t a witch after all. Is that supposed to be the lesson of all this? That I should be nice to her?” He heard a strange rumbling, different from before, and it took him a minute to realize the monster was laughing. “You think I tell you stories to teach you lessons?” the monster said. “You think I have come walking out of time and earth itself to teach you a lesson in niceness?” (63). This reminded me of some of the work I recently did at the Teachers College Reading and Writing Project’s summer institute for the teaching of reading. One of the best ongoing conversations at multiple sessions was about how students often don’t do the reading work that will move and change and transform them as people–they look at a complex text and often want to reduce it to the first lesson they can come up with–but this is empty work when in a rich text. Life–and the best kinds of stories–are far more complex than to reduce to a single lesson. And it is a sad day when amazing books get reduced to looking for a lesson (which seems to be what standardized testing is trying to do to reading–reducing it to a task, rather than an opportunity to understand what it means to be human, what it means to belong, to escape from reality for a moment, I could go on). Conor goes on to say: “I don’t understand. Who’s the good guy here?” The moster replies: “There is not always a good guy. Nor is there always a bad one. Most people are somewhere in between.” Conor shook his head. “That’s a terrible story. And a cheat,” (64). This is where so many middle grade students find themselves–and because they have been trained to look for the “lesson” on a standardized test, or because for whatever reason they want to look for the easiest way out of a story rather than linger in what it is really offering. The rest of the story follows Conor navigate and make meaning through the darkness in a way that stunned me as a person. Like the monster says, stories are wild creatures. They help us see. They help us heal. And I love that it is my job to get books in the hands of kids and to teach them how to make their thinking messy, because that is how life goes. This entry was posted in a monster calls, books, brokenness, grief, honesty, story as metaphor, teaching, young adult lit on July 14, 2013 by krobb08. I read mostly fiction. I believe–and tell my students–that fiction can often be more true than fact in the ways that it can teach us about life. What I’ve come to learn, though, is that it’s not necessarily fiction per se, but narrative. Story. We are doing a coming-of-age literature unit and my biggest hope is that my students, just beginning some of the uphill climbs of growing up, can find hope in the ways that the protagonists they are reading get through their struggles. I want them to see that in studying the classic story mountain structure, that there are hills and valleys that are sometimes hard to make sense of or see their way out of, but that resolution comes. Often, it is not what was originally sought after, but there is a knowledge and a wisdom that appears after making it through. Everything seems to be aligning, though, because recently I’ve come across two nonfiction resources that have discussed this same phenomena: that understanding narrative can help people emotionally process through life better. The second comes from Brene Brown, a writer and researcher whose work has been really influential for me since I first saw her Ted Talks in the fall and recently began reading The Gifts of Imperfection with a good friend of mine (one of my few non fiction books this year). Obviously, she speaks about our state as imperfect humans, and the fact that despite we know that about ourselves, we often live in ways that demonstrate the opposite. One of the core tenets of her research has been “when we can let go of what other people think and own our story, we gain access to our worthiness–the feeling that we are enough just as we are and that we are worthy of love and belonging.” Own our story. This is a life changing sentence, that brings me back to the idea that the greater understanding we have of the “mountain of action” structure of life–knowing their will be new starts, rising action, climax, falling action and resolution–the healthier we become. On that note, I’m looking forward to making my summer reading list, which I’ll be posting about soon. This entry was posted in brene brown, new york times, nonfiction, story as metaphor on June 2, 2013 by krobb08. Cloud Atlas: If anything can save us, it’s narrative. I have been looking at this book for years: I’ve read the back cover, added it to my lists of books to read, and yet never picked it up. In mid-December, though, it came up in conversation and I found myself vowing with two friends that it would be the next book I read. Cloud Atlas became my companion for two weekend trips on planes, my Christmas break and the first ten days into the new year–so needless to say, its 500 pages and nesting-doll style of six interwoven stories has messed up the number of books I usually finish in the winter. But. This is the kind of story that left me thinking about so much that I hardly know how to approach it in a space like this, much like last year’s winter read of Kaftka on the Shore. Both deserve a seminar class. To give a bit of context, the novel is made up of six interwoven stories that are cut off mid way through and then continue as though mirrored to their conclusions. Interestingly, each story becomes a text of sorts in the next story as they progress from the 1800s all the way through a post-apocalyptic future: one is a journal that someone in the next story discovers, one is a set of letters that the character in the next story discovers, etc. Each narrative set has its own style and allusions to various kinds of narratives: mystery, romance, fantasy, epic, etc. David Mitchell explores the seemingly unchanging nature of humans and our up and down patterns both individually and corporately throughout time. I wish that I had a professor to tell me to be on the look out for such things while I was reading–because now I feel like it deserves a reread to truly study what Mitchell was up to. What I am left thinking the most about though, is a comment I found in The Guardian while researching after I finished the book. The author noticed–and what Mitchell surely implied– is that as the reader makes her way through the narrative of time, that storytelling survives science and that if anything can save us, it’s narrative. If anything can save us, it’s narrative. This entry was posted in books, david mitchell, story as metaphor on January 19, 2013 by krobb08.